Twenty-five miles northwest of Orlando is Mount Dora, an idyllic lakeside city of just 13,000 residents that is known for its antiques and arts. It is a quintessential all-American town that captures an innocence that is absent from neighboring larger cities. Visiting Mount Dora, I would be willing to bet that it is the kind of place where it is good to grow up and raise a family. People probably know their neighbors and the restaurants like the one I went to welcomed regulars and the wait staff did indeed know their names. The streets are lined with boutique shops that sport New England inspired architecture. It is a treasure trove for the antique or knick-knack connoisseur. It is a slower and simpler kind of life that possesses a wholesomeness that is elusive to so many other cities. Mount Dora also whole-heartedly embraces the spirit of the holidays. If possible, the city becomes even more charming with the presence of the twinkling lights and the giant Christmas tree that serves as the centerpiece of the historic downtown. 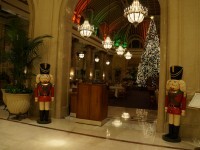 It is the ideal place to celebrate the holidays, take a stroll and share with those closest to you.